May 6, 2014 — Last weekend I had the pleasure of attending the Classy Awards and Collaborative in San Diego, CA. 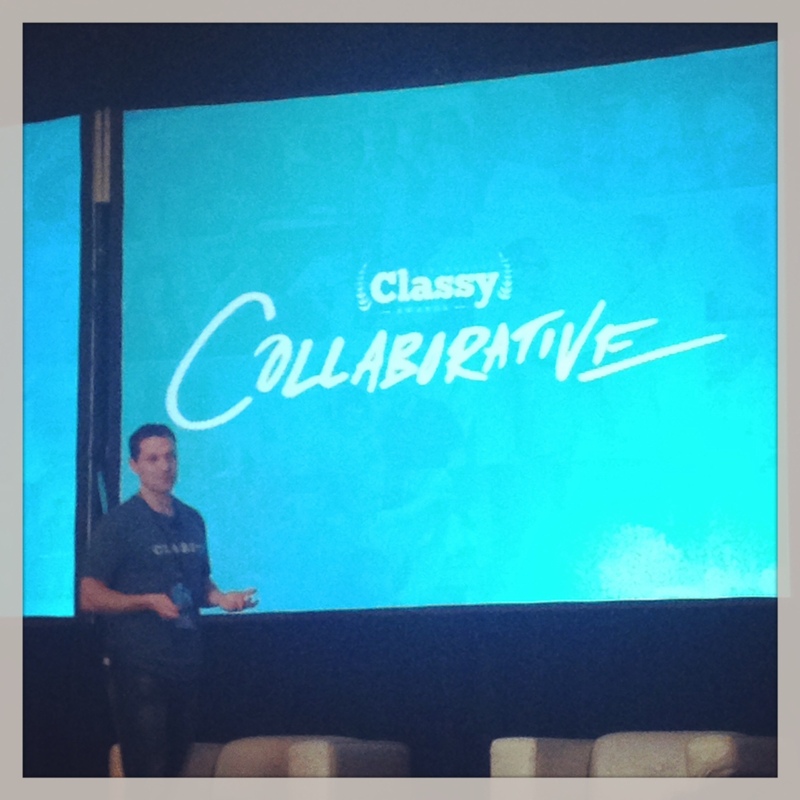 Hosted by Stay Classy, the event featured two days of collaborative sessions on topics ranging from nonprofit technology to modernizing disaster relief to the power of collective thinking to ending hunger in America. The weekend ended with an awards ceremony honoring many nonprofits whose work in the past year is worthy of recognition. Hundreds of nonprofit representatives from all over the country (and a few from abroad as well!) were in attendance, and I was lucky to meet and connect with many of them during the weekend-long event. Read on to hear more about what I learned. The conference kicked off with a panel presentation on relief aid featuring OCHA, UNICEF and World Bank’s Innovation Lab. The discussion covered social progress and innovations in delivering aid around the world, and disaster preparedness was a central point of discussion. “Preparedness and prevention is a new business model for addressing disasters,” said Lesley Bourns of OCHA–and her fellow panelists agreed. When we identify a community’s most vulnerable members, and better prepare them for possible disasters, we’re actually helping them get back on their feet in the aftermath of a disaster. This shift in how we look at disaster relief has impacted many organizations working in humanitarian aid, and is helping us strengthen and build resiliency in communities around the world. While many humanitarian aid groups are effective in providing relief and recovery around the world, the panelists is this session all agreed that we all could do better when it comes to listening and using feedback to strengthen programs. The modernization of the sector is helping us deliver aid smarter and more effectively, but as Aleem Walij of World Bank Innovation Lab noted: “It’s not a simple technical problem, we have to think outside the box…. and data means nothing if you don’t know what to do with it.” He went on to explain that while technology is rapidly advancing in the developed world, simple technology is still making leaps and bounds in underdeveloped countries, and we can use that simple technology to work more efficiently. For example, mobile phones now allow us to gather feedback from remote areas, helping us to better serve those communities by meeting needs that they themselves have identified. “It’s not about experts coming up with solutions, it’s about creating change based on feedback from the people we touch,” said Walij. Third world communities don’t need a fancy website or complex systems, something as simple as SMS messaging can revolutionize the way they communicate with the world, and in turn help them advance even further. Craig McClure of UNICEF also noted that feedback and data analysis are important tools in evaluating programs to fuel future progress. “What can we do better next time?” is the question we should all be asking, he said. Often, those of us in the nonprofit sector become acutely focused on the areas in which we work. This session discussed this tendency toward tunnel vision from the perspective of food security. While the obvious solution to hunger seems to be food delivery, the panelists in this presentation argued that hunger is a symptom of the greater issue of poverty, and it’s important to take a step back and look at the bigger picture in order to better combat the issue of poverty at large and, as a result, reduce hunger. “When people are overwhelmed by poverty, it’s really hard for them to hone in on nutrition as a priority,” said Marianne Haver Hill, “and most people have no idea that such poverty exists so close to where they live.” Solutions are attainable, the panelists argued, if we step back and re-approach the issue, think differently, and address underlying political issues such as wages and nutrition education. Panelist Robert Egger struck a chord with the crowd when he encouraged the nonprofit sector as a whole to “leave behind the notion that our mission is to serve and adopt the notion that our mission is to empower.” He and his fellow panelists went on to recommend that we rethink the way we approach the issue of hunger, advice that can be applied to many causes across the sector as a whole. Collective Impact is the idea that when a number of individuals and organizations combine their core strengths and competencies, they can have a greater impact as a group. In this session, Dr. Barbara Van Dahlen and Thomas Meyer discussed how true collaboration (abandoning the instinct to let one person/group lead) generates innovative solutions and a greater capacity to meet needs for vulnerable groups, such as veterans in America. This is a fairly new method, and Meyer noted that one of the greatest challenges is not just inter-organization collaboration, but also organization-donor collaboration–re-thinking how we communicate with funders. It is important to help them understand that when they fund the laying of a foundation for future longterm projects, they have just as much of an impact as when they fund a specific project with more tangible, direct results. If we can rise to the challenge of raising funds for collaborative projects, collective impact will result in bigger, better, more innovative solutions for complex issues in the future. Working for an organization that focuses on disaster relief, these sessions were far and away the most exciting and inspiring that I attended while at the Collaborative. First, Michael McDaniel of Reaction Housing shared an overview of RH’s innovative design for sturdy, safe shelters to be used in the aftermath of disaster. Not only do they have solid walls and a floor (which, believe it or not, most shelters currently being used do not), but they also are uniform and stack together like coffee cups, making it easier to transport and assemble the units–saving thousands of dollars on production and shipping. With millions of people worldwide in need of shelter due to disaster and conflict, Reaction Housing is working to give those people back a sense of security and dignity, while making it easier and more cost efficient for relief agencies to deliver. McDaniel’s main point: we have the capability to do more through tech and innovation (such as stackable shelters), and we need to disseminate these new possibilities and make these more efficient practices the norm. Better solutions mean getting more people the help they need. Next we heard from David Jones of Rescue Global, who talked about his organization’s mission of getting on the ground in areas “beyond conventional reach.” The organization sends teams of highly trained and skilled people out into the field–and those people take extreme risks to perform needs assessments, gathering information and transmitting it back to agencies who are poised to help. “Without information from the impacted areas, you can’t respond to a disaster effectively,” Jones said. Technology is certainly helping, he noted, with innovations like Google Glass and balloon-powered internet aiding communication, but humans still play a vital role. Rescue Global is at the forefront of using a human/tech combination to close the gap between identifying needs and getting those needs met, especially in more remote and secluded areas of the globe. They are leading a shift in how we evaluate the impact of disasters and conflict, and more importantly, how we react to them. The combination of data gathering and mapping, technology, and boots on the ground is advancing disaster relief and will help organizations (like Operation USA) that specialize in focused relief aid areas to have a greater impact. See a full overview of all the weekend’s sessions here.